I have this favorite tank. It's a burnt orange racer-back by American Rag (a Macy's company) that I got on sale during winter. It fits perfectly and I love the style. But the stitching has come undone and while any seamstress could fix that right up, I really wanted another one altogether. 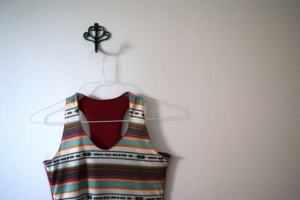 I've been seeing posts about copying articles of clothing you already own to create your own patterns so I thought I would try it with this tank. I wish I had done this sooner! This is genius! I folded my tank in the middle and traced it onto a sheet of paper. Now, I only had one piece of paper long enough for the whole tank and I was too lazy to find another. So I took a smaller piece, folded the back of the tank and traced just the top. To trace the pattern onto my fabric, I folded the fabric in half and simply traced the pattern for the front and then the back. SO EASY. 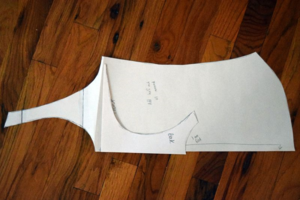 tank pattern with front piece out. 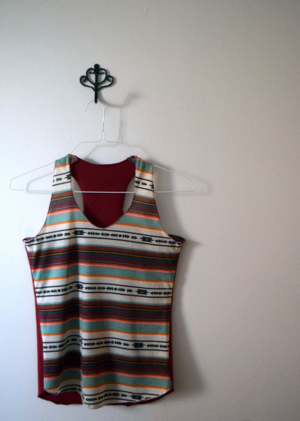 tank pattern with back piece out. 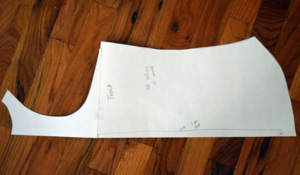 All that has to be done is cut out the fabric (I added half inch seam allowances all the way around but you only need it where you are sewing the tank together), sew the front and back (right sides) together at the shoulder and side seams and you have a tank! I can't wait to use all my leftover knits for some of these. I wouldn't mind making a longer version too for a lounge tank. 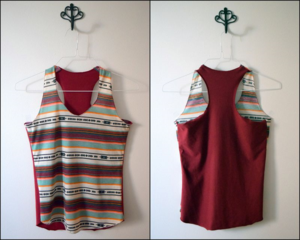 If you were curious about copying a wearable in your closet, go for it! !